Automatically generating the mappings that businesses can use to correct data. These mappings are based on rules that businesses choose to apply to the data. 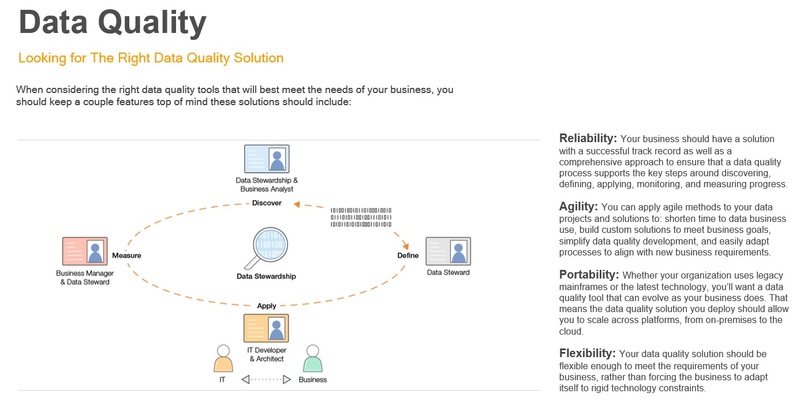 Enabling businesses to include data quality and data profiling as an integral part of the data integration process. Storing metadata regarding the quality of the data alongside the actual data. The scope of your metadata management defines how you capture and represent your data lineage—giving you an audit trail which can be as granular or high level as you like. emarchy designed xDM as the world's first fully-functional Master Data Management (MDM) solution to bring material design and a truly agile business-driven solution to the enterprise. Owing to the algebraic concept that "x" can be anything, xDM is unique in its breadth of ability to master any kind of data -- customer B2B and B2C data, product data, reference data, metadata, location, organization, supplier, etc. As such, xDM is a true evolution of the Semarchy multi-vector MDM solution for integration, management, and governance of enterprise information. This approach, which is implemented in an iterative fashion, to how and who manages master data and reference data, resolves the most pressing challenge of data-driven organizations, which is to give more control to business users.